Get superior results with our High Quality Roll Laminating Film. It’s an excellent way to preserve and protect all of your documents, large signs and banners. We offer 1.5 to 10 mil thickness in a variety of sizes, most with a 1” core. Other films and core sizes also available, call us for a quote at 1-800-443-7557. High Quality Premium Standard Roll Laminating is extremely popular with schools as well as copy and print shops. FREE SHIPPING ON ORDERS OF 12 ROLLS OR MORE OF OUR MOST POPULAR LAMINATING ROLLS. 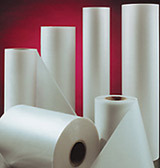 This is our Most Popular 25'' & 27'' High Quality Standard Roll Laminating Film. It Is Available In 1.5 And 3 mil Thicknesses. Call 1-800-443-7557 for Special ''Volume'' pricing on 50+ rolls. Must be ordered 2 Rolls at a time. Packaged 2 rolls per box and has a 1'' core. High Quality Premium Standard Roll Laminating is extremely popular with schools as well as copy and print shops. This economical laminating film adheres to a variety of material. The film is made of a polyester base and a polyethylene adhesive that produces clear laminations. This clear gloss laminating film produces great looking laminations at a great price. Premium Grade Low-Melt Film is made of a copolymer adhesive that reduces film distortion and improves clarity. It provides excellent encapsulation on a wide variety of materials. It’s perfect for high speed applications. This Low-Melt Roll Laminating Film allows you to laminate material at temperatures ranging 220-250 degrees which puts less stress on the graphics and allows for better results. This Roll Laminating is excellent for commercial applications. Packaged 2 rolls per box and has a 1” core. EZ-Load Roll Laminating Film is specifically designed for use with GBC EZ-Roll Laminators. This roll film is easy to load and has color coded end caps which help to eliminate operator error when loading the film onto the laminator. This wide format thermal laminating film is specifically designed for large formal output. The low temperature 185 degrees was designed to accommodate new types of ink. Designed with UV inhibitors, this roll laminating will help protect images from harmful UV rays. The Digikote roll film will help printed pages remain bold and colorful 5 times longer than an uncoated page.